Limited Edition Mint in Box! 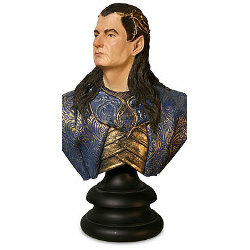 Gil-Galad Bust from the Lord of the Rings. When Sauron's evil threatened all of Middle-earth in the Second Age, High Elven King, Gil-galad, together with his ally Elendil, king of the Men of Numenor, mustered a great force to repel the Dark Lord's advance. A mighty warrior in battle, Gil-galad personally led the assault on Sauron's fortress. It would prove a fateful day for the last Elven king. Gil galad is brilliantly captured in this 1:4 scale bust. He has been hand cast in heavy weight polystone and hand painted to the highest standards. He sits on a classically turned base that includes his full name and the sculptor's signature.